Pure and Planet Rock to auction radios signed by rock royalty | What Hi-Fi? Pure and Planet Rock are to auction 15 Pure Evoke-1S Marshall digital radios signed by rock legends such as the Foo Fighters to raise money for charity. The money is being raised as part of Planet Rock's Movember campaign, which raises funds and awareness for men's health issues, specifically cancers that affect men. The Pure Evoke-1S Marshall digital radios have been signed by members of bands such as Foo Fighters, Thin Lizzy, Def Leppard, Status Quo and Deep Purple. 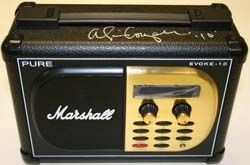 Alice Cooper's autographed radio is pictured above. The signed radios will be auctioned individually in batches of five over three weeks from November 7th. Head to the Planet Rock website for more information on the auctions and a full list of signatories.